Are you ready to give your kitchen a face-lift? If the answer is yes, there are a few things you should know. First of all, the kitchen is arguably the most important room in the house. When you remodel your kitchen, it has the potential of significantly increasing its overall value. Not to mention the change in appearance will make cooking more pleasant. The problem with countertops is that there are simply too many options on the market. We are here to help you with a few kitchen countertop ideas with pictures, to guide you through the variety of materials. Why are materials so important? 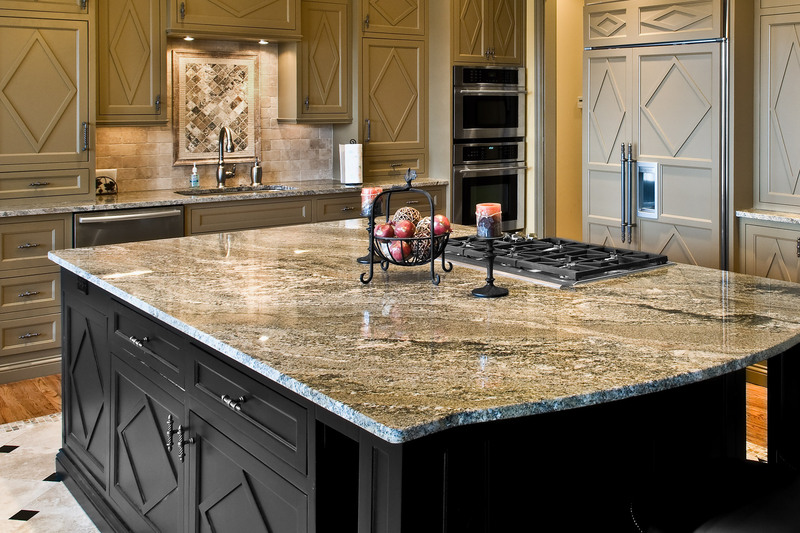 The fact of the matter is that the material you choose for your countertop will determine the durability, comfort, and atmosphere of your kitchen. Each material has its pros and cons. If money is an issue, you might want to go with a cheaper choice. Kitchen countertop ideas on a budget include good-quality laminates which cost around 20-30$ per linear foot. However, if you have a higher budget, you should definitely go with stone. You should also consider the type of approach that you will be taking. You can either take everything out, and commit to a full-scale remodel, or simply change your countertops and keep appliances and cabinets. When you start your kitchen remodel project, be aware that the disposal of countertops is expensive. Replacements are even more expensive, so you will want to invest wisely. Here are our top kitchen countertop ideas, based on price, materials, and durability. 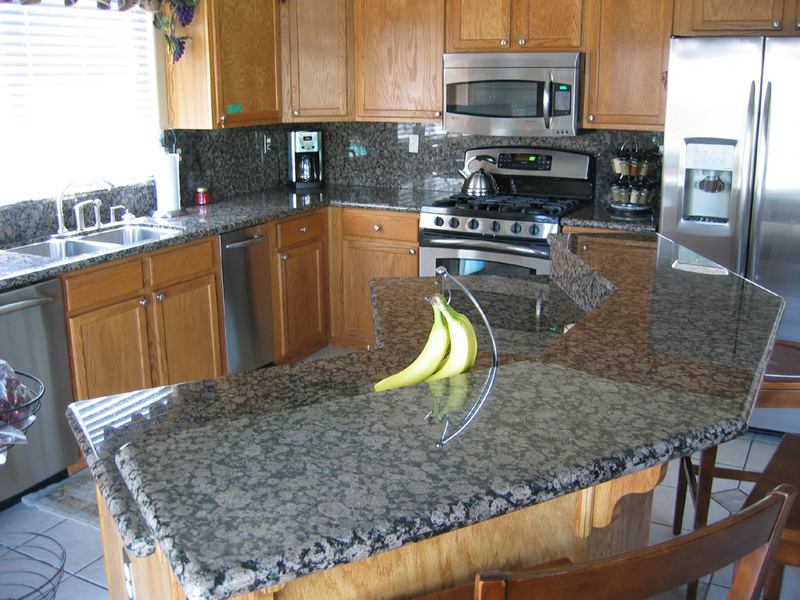 Slab granite kitchen countertops are without a doubt the most popular countertops on the market. They burst into the scene approximately 20 years ago. However, you can be sure that they are useful, because even your grandmother has them. Ask anyone and they will tell you that they are the most highly valued types of slabs, which can only be quarried and fabricated by seasoned installers. If you want to increase the overall value of our kitchen, go for slab granite kitchen countertops, as they will produce few seams over-time. Nevertheless, they are not the ideal choice for decorators on a budget. 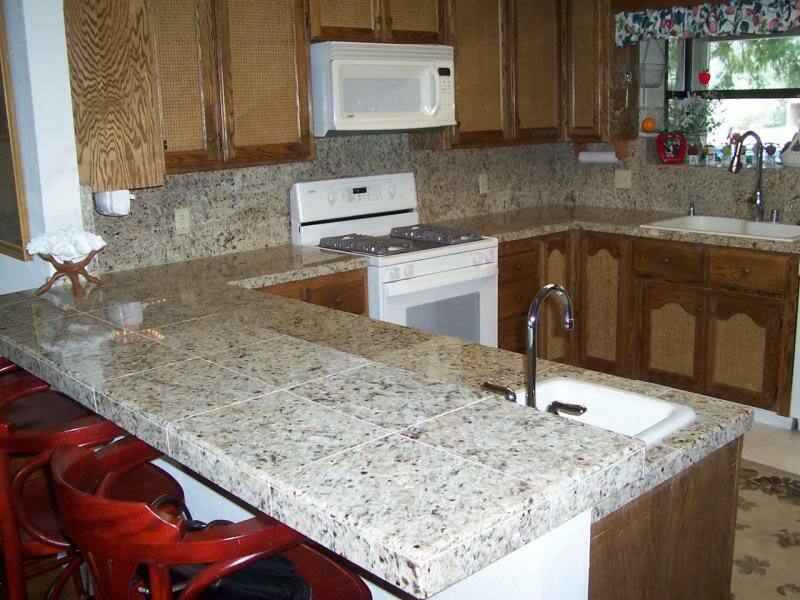 Number two on our kitchen countertop ideas are the modular and tile granite countertops. The problem with slab granite is that it is not very DIY-friendly, and quite costly. The best alternative in this situation is modular granite, because it comes in medium-sized sheets. Any homeowner can easily install them. As far as tile granite countertops go, they come in even smaller, more manageable sizes. This means that they are also easy to DIY-install. On the downside, they are lower in prestige, due to their many seams and inferior quality. However, they are among the best DIY kitchen countertop ideas. 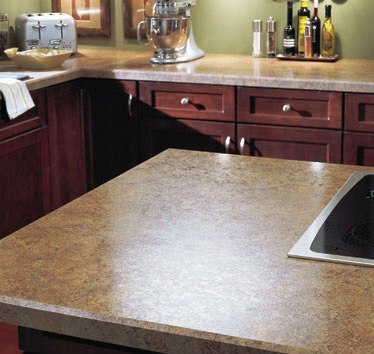 If you are searching for something truly affordable and durable, then laminate countertops are the ideal choice. Their main downside is the fact that they can peel up, chip, or scorch easily. Nevertheless, their unbeatable price, ease of installation, and pre-fabricated nature convince many homeowners to use them. 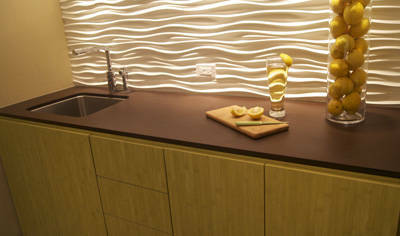 They represent the true democratization of countertop installation – light to carry, inexpensive to purchase. Most reputable manufacturers such as Lowe’s, IKEA, and Home Depot offer them at great prices. Furthermore, approximately 75% of laminates which are sold in the United States come from Wilsonart and Formica. Formica offers 96 solid colors and patterns, while Wilsonart boasts a collection of over 230 colors and patterns. Laminates are among the most popular kitchen countertop ideas on a budget. Engineered stone is a very popular choice for many homeowners because it successfully combines the durability of natural stones, with the playful palette of solid surfacing. It is easier to maintain, but still preserves that rugged appearance of granite, and comes in a variety of prices. Not everyone likes its appearance, though. However, considering that it is stain & scratch resistant, unfazed by heat and unaffected by coffee, citrus, vinegar, and other substances, it is a viable choice. Prices for it range from 60 to 120 dollars per square foot installed. What is it made of? Most engineered stone consists of 93% natural quartz particles mixed with pigments and resins. This means that it can come in dozens of colors, including modern, vibrant shades. They are another great option for those looking for cheap kitchen countertop ideas. 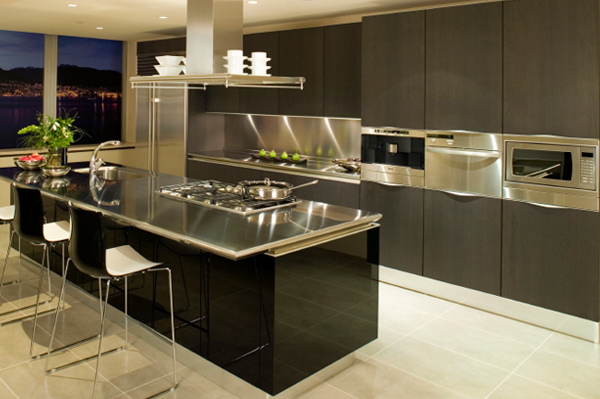 Our list of kitchen countertop ideas continues with a very futuristic material: stainless steel. There are many incredible benefits to this material. First of all, it is stain and heat resistant, and extremely durable. It is without a doubt the best choice for smaller kitchens, because the reflective surface will make it appear larger. Also, if hygiene is a concern, you should know that the nonporous nature of this surface will make food preparation easier, and cleaning a breeze. One word of advice though, try not to cut directly on the surface, or drop heavy objects on to it. Stainless steel countertops are usually made from an alloy of chromium, so they do not rust or corrode as easily as regular steel. A few years ago, concrete counters could only be found in high-end, or “creative” homes. Nowadays though, they have gained more ground. 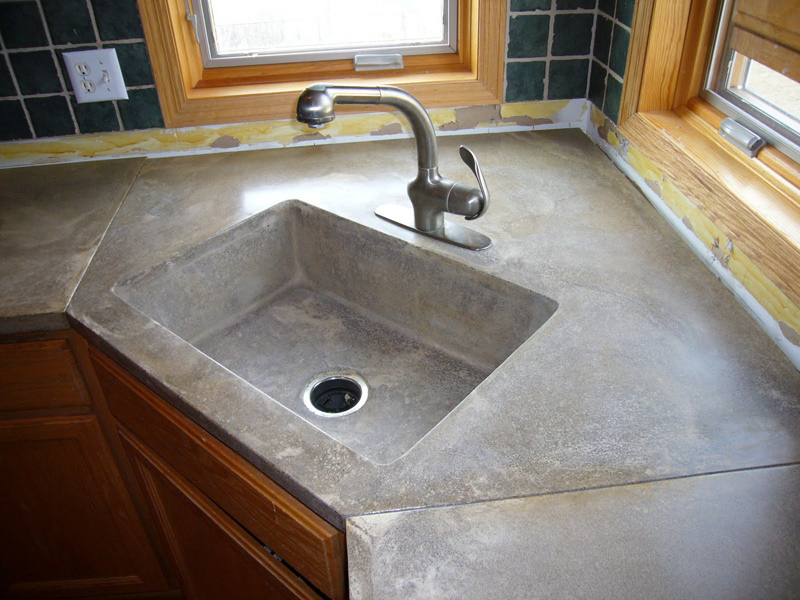 What you should know about concrete countertops is the fact that they are poured on the site, for more durability. They can also be prefabricated, but that might result in small cracks. 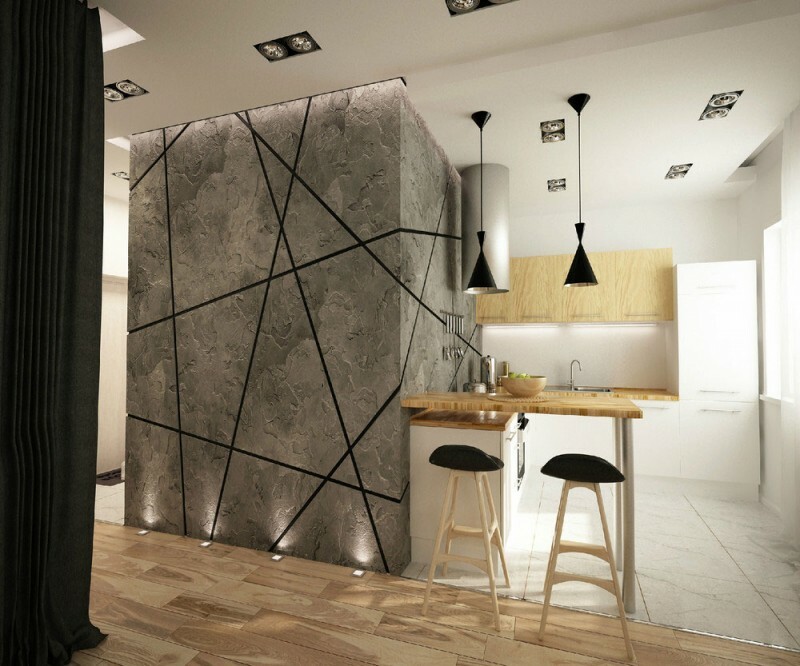 If you are looking for something truly unique, or a controversial kitchen countertop idea, you should definitely consider concrete. On the downside, concrete is a heavy material which requires expansive work. Of course, its versatility outweighs the material heaviness. Read more about Concrete Countertops on HGTVRemodels. 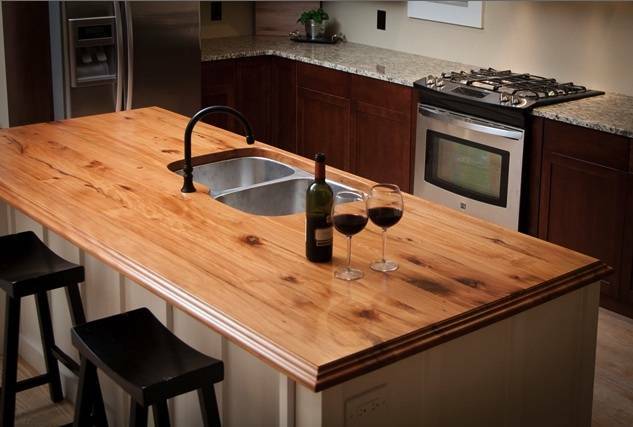 Have you ever considered adding wood countertops to your kitchen? Probably not. This is because wood, in general, doesn’t work well with water and other chemical substances. Reclaimed wood is an entirely different story. You can use it for flooring, siding, barns, and of course, furniture or kitchen countertops. They are definitely an interesting choice, especially if you are going for a unique, distinctive, vintage, or antique feel. The benefits of reclaimed wood are its eco-friendly nature, highly distinctive appearance, and classic look. The only downside would be the fact that it requires a lot of tung oil for sealing, and research beforehand. 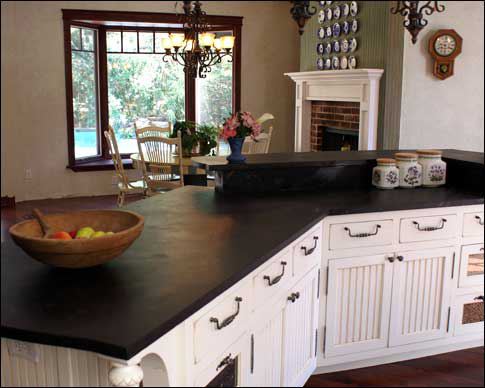 Soapstone Counters are all the rave nowadays. If you are looking for modern countertop ideas, they will definitely fit the profile. Despite their name, they are not as soft as you may think. In many ways, they are similar to marble, because they have a classic look and feel. On the plus side, they are not as cold as marble, because they contain a high amount of talc. So, if you want an antique feel for your kitchen, choose this material. You should be aware, however, that they can gouge and scratch, and are usually affected by the passage of time. Sure, the first thing that might come to mind is the fact that paper composite kitchen counters are made up of thin pieces of newspaper, but that’s not true. These tops are another great choice for kitchen countertop ideas on a budget. They are made from paper impregnated with resins, which makes them extremely durable. Not only are they affordable, but they are also environmentally-friendly, because they consist only of recycled paper materials. The resins used are green, not petroleum-based. The only downside to them is the fact that they are difficult to obtain, so you will have to place a special order. There is a myriad of recycled glass countertop options on the market at the moment, but you don’t necessarily have to settle for them. There are also several options that you should consider when brainstorming for kitchen countertop ideas that are not recycled. 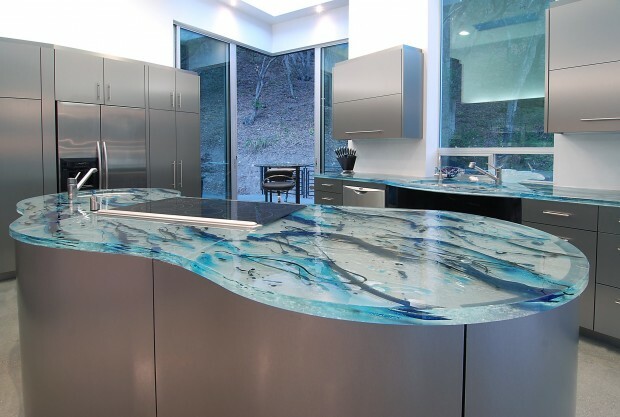 The best part about glass kitchen countertops is that they are extremely resistant to bacteria, scratches, mold, stains, and other chemical substances. Also, if you are going for a futuristic look, glass is probably the ideal choice (besides stainless steel). It has a fascinating and captivating look which cannot be duplicated. Make sure you don’t drop heavy objects on them, they may be scratch resistant but they are definitely not impervious to high tensile strength. Every kitchen project should start with the materials. Many homeowners have absolutely no idea just how much a certain material can change the ambiance of their rooms. In order to preserve interior unity, you should use the same materials in several rooms. Although there are many available on the market, each of them has its strength and weaknesses, so you should plan wisely. After you have chosen the appropriate material, you can proceed with other considerations that are relevant to your kitchen countertop ideas.